If you support multiple brands, you can add and assign phone numbers for each brand. Calls to and from those numbers will have the associated brand value on the resulting tickets. 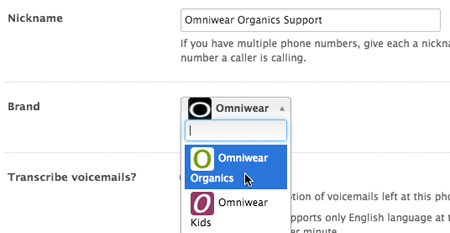 Alternatively, if you are on the Brands settings page, click open one of your brands, then click Add a phone number. You might have to scroll up to see it. Select a phone number, then click Choose number. Click Purchase this number to confirm your choice, then click Finish. Click Edit beside the number you just added. Enter a Nickname for the number, then select a Brand. The phone number's brand will only be identifiable on the phone numbers page if you include it in the nickname. For example, Omniwear Organics Support. Modify any of the settings as needed, then click Update phone number and settings. Click the Admin icon ( ) in the sidebar, then select Channels > Talk . Click Edit beside the phone number where you want to change the associated brand. Select a different brand from the Brand drop-down menu. Click Update phone number and settings. Is there a way we could select multiple brand for a number and then when making an outbound call, select which brand you are calling from so it gets categorized on the ticket properly? We have a main support number and our IVR goes something like, "Press option 1 for customer support, press two for all other calls." If they press option one, then they get several options for different products. We use this same number to call out with and I would like the agent to be able to select which product they are calling about when making the call, is this possible?